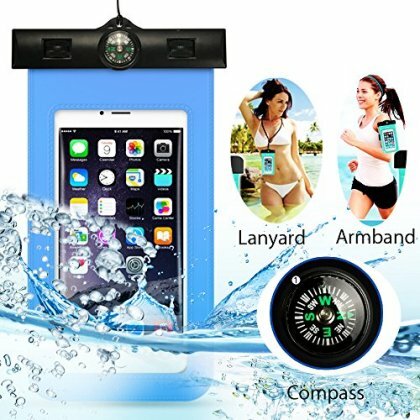 Multi-Function: With an armband on the back, it is not only a waterproof case but also a sports armband. The compass on the top can help you find your way home when getting lost in the wild. IPX8 CERTIFIED WATERPROOF: Completely protect your cellphone up to 30m/100ft deep underwater. Support full screen touch function. Allow easy access to take photos, send messages, make telephone calls, or record video through the crystal clear windows on both sides. Fits to all cellphones up to 6 inch, like iPhone 6/6 plus/6s/6s plus/5/5s/4, Samsung Galaxy S6/S6 Edge/S5/S4, Note 4/3/2 and more.